If you are looking for a cozy little place at a budget price which is clean and comfortable with nice friendly staff and located conveniently yet at a distance from the crowd, then this is a good place to choose. 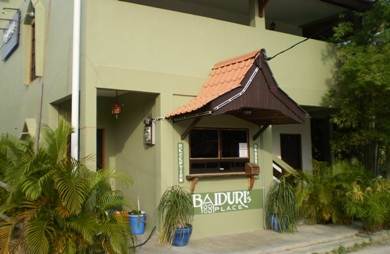 Baiduri's Place has only three well appointed rooms and located in Pantai Cenang. Remember this is a budget hotel and therefore you can not expect five star amenities here. It is run by a family. Michelle and Rajis will make all efforts to make your stay a comfortable one. The location is at the southern end of Pantai Cenang close to the famous Underwater World and at the backside of a road. This makes the place little quiet and peaceful being a bit away from the main crowded area of Pantai Cenang. However the beach (Tengah Beach) is only couple of minutes walk from the hotel and is on the same side of the road. The rooms are simple but have all the amenities of a good budget hotel. The rooms have either a queen size bed or twin beds, they are quite spacious and clean. The attached bath has hot shower (Chinese make shower mixer with instant geyser) and the water pressure is good enough for a nice bath. The air-conditioning in the rooms are good as well. Even a budget hotel like this offers a mini bar or a fridge in the room which allows you to keep drinks and food chilled. There is a TV in each room but running only local Malay channels. So unless you understand the local language, you would probably never use the TV. The beds are soft and nice. There is a cute dormitory for four persons here with two double decker (bunker type) beds. They also have limited car park. The place is extremely convenient. Just outside the hotel and along the road you will find host of restaurants and shops. Within less than one minute distance there is a Mc Donald outlet, Zon and Coco Valley duty Free shops etc. So if you are looking for cheap alcohol or beer, or chocolates, perfumes etc, you are right next to some great stores & shopping centers. The hotel will help in organizing tours and excursions at reasonable rates. They offer free wi-fi in public areas. Check in at 2pm, Check out at 12noon. There is no room service available. The reception is open from morning hours until 10:30pm. 1) Nice spacious and clean rooms. 2) Friendly staff including the receptionist who are all very helpful. 3) They provide electric kettle for boiling water and hair dryer on request but free of charge. 4) The location is really nice. Although it is in Pantai Cenang, being at the farthest end, it is a bit away from the noisy area but still enjoying all the amenities and ambience. 1) They won't clean up the rooms and make the beds usually during your stay unless you specifically ask for it. 2) We found some cracks in the toilet walls which can be easily repaired. Small issue though. 3) Cable and international channels in the TV would help foreign tourists. Jalan Pantai Cenang, Tanjung Mali, Mukim Kedawang, 07000 Langkawi. Baiduri's Place is located at the southern end of Pantai Cenang and next to Underwater World.